Recently released journalist, Jones Abiri, has demanded a compensation of N200 million from the Nigerian government for his prolonged detention without trial. Mr Abiri’s application was heard on Monday at an Abuja Division of the Federal High Court. 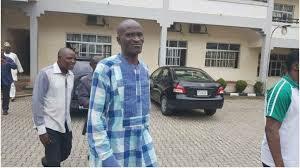 Mr Abiri, a publisher of a Bayelsa State-based weekly paper, Weekly Source, was arrested by operatives of Nigeria’s State security service in July 2016 and detained till July 2018 without trial. He we was later arraigned following wide condemnation of his prolonged incarceration, and was subsequently granted bail. In an application brought before the Federal High Court, Mr Abiri is asking the court to compel the SSS to pay him for the flagrant abuse of his rights and torture experienced during his detention by the operatives. According to the application, Mr Abiri’s lawyers, led by Femi Falana, are submitting that the prolonged detention without trial violates their client’s right to personal liberty, dignity of person, freedom of association and fair hearing among others. The case was however not heard on Monday, as the respondent was yet to file an affidavit replying to the motion brought against the SSS. When the case was called, Mr Abiri’s lawyer, Samuel Ogala, appeared for the applicant, but the SSS counsel, G. O. Agbadua, asked the court for time for his client respond to the application. The matter was subsequently adjourned till September 3 for further hearing.